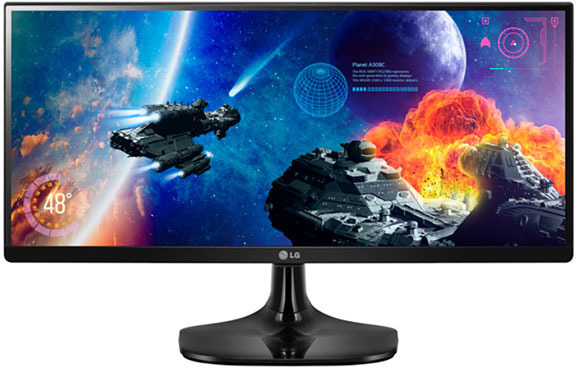 Want to go the ultrawide route for gaming but can’t splurge on either a top-end monitor or graphics card? This article exists to help, with a look at two ~$250 graphics cards running at the “budget” resolution of 2560×1080: AMD’s Radeon RX 480 8GB, and NVIDIA’s GeForce GTX 1060 6GB. 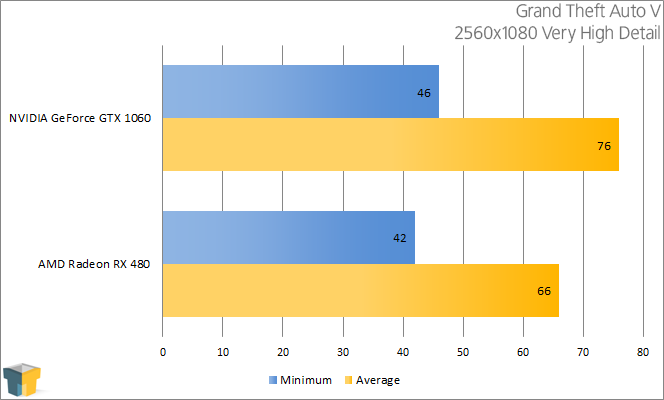 In our launch articles for AMD’s Radeon RX 480 and NVIDIA’s GeForce GTX 1060, we tested with just two resolutions (1080p, 1440p) for the sake of time, which was unfortunate as I had wanted to get an ultrawide resolution in. As this article might give away, that’s being rectified here with a special look. Given their price points of $240 and $250 (USD), it’s not hard to assume that AMD’s 8GB RX 480 and NVIDIA’s 6GB GTX 1060 would be well-suited for 1440p (2560×1440) gaming. As we found out in our launch reviews, that’s very much the case. With these cards, you can either opt for excellent 1080p performance, or good 1440p performance. Or… as we find out here, great ultrawide performance. What do we mean by “ultrawide”? In this particular case, it’s 2560×1080, which is the “budget” option for ultrawide today. Testing at 3440×1440 is best left to the beefiest cards on the market: NVIDIA’s GTX 1080 and GTX 1070. I had huge ambitions when deciding to undertake this article, but I admit that I was left a bit unimpressed with it in the end. 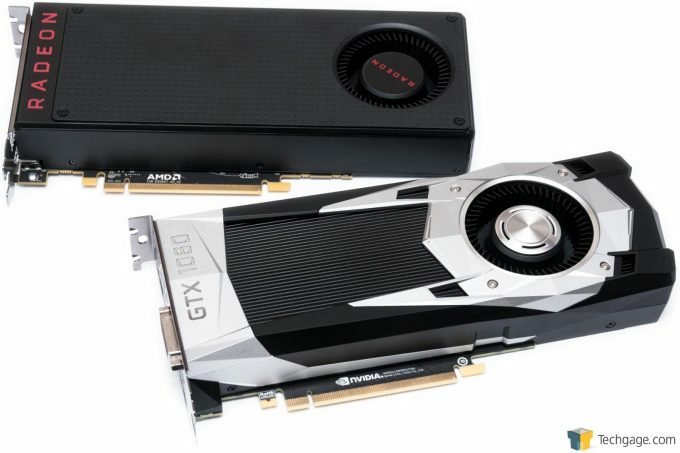 The reason is simple: both of these GPUs are what I’d consider “ideal” 2560×1080 cards. Since both of them handle 1440p quite well, it’s a no-brainer to conclude that they’re also good at ultrawide since it’s a matter of taking 1440p and shaving 360px off of the height. Ultimately, though, what this means is that if you have “budget” ultrawide in your sights, as well as one of these new GPUs, you’re going to be very happy. There’s no sense in spreading a simple article like this over eight pages, so instead we’ll stick to just the one. For explanations of each test and our methodologies, please click on one of the articles linked to above. Since we don’t have a monitor with native 2560×1080 resolution, I opted to take advantage of the custom resolutions setting in both AMD’s Catalyst and NVIDIA’s GeForce driver so that I could test at it. In most cases, both cards handled the non-native resolution fine, although certain games had to be run in borderless or windowed mode because they disagreed with it. 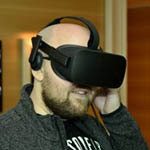 Fortunately, that didn’t appear to affect performance at all, as the results scale with those from our launch articles. All of these tests were manual runthroughs, with Fraps acting as the framerate score-keeper. Each run takes at least 1 minute to perform, and is completed twice to ensure accurate averages. 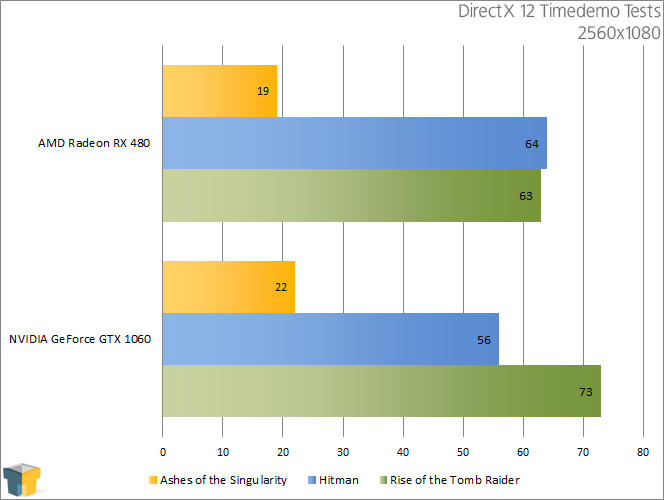 Using the same graphics settings we do for our regular GPU reviews, we can see just how brutal games like Rise of the Tomb Raider can be on cards of this price point, and not to mention classics that still mean business like Crysis 3. Still, both cards performed well overall at this resolution, but there are some obvious compromises that will need to be made in select titles. We’re unable to benchmark with a solution a la Fraps in DirectX 12 at the moment, so I’ve opted to stick to using built-in timedemos across three current DX12 titles. 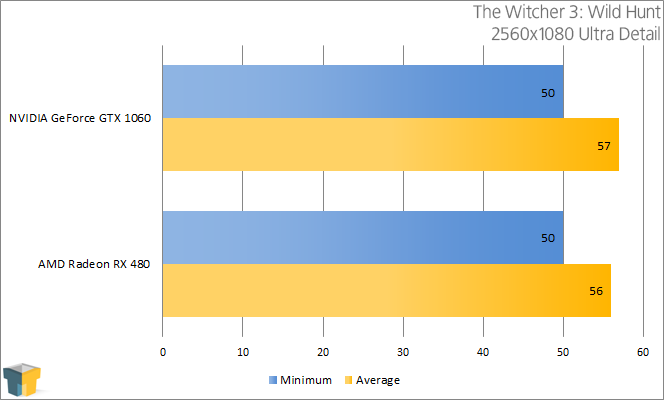 As we saw in the RX 480 review, AMD’s Hitman performance far surpasses NVIDIA’s. Another trend we see again is that Ashes, which was AMD’s go-to DX12 benchmark for so long, was beat out by the GTX 1060. Given the performance we saw earlier, what this tells me is that it’s simply NVIDIA’s extra grunt that pushes it ahead, rather than some DirectX 12 optimization. The same applies to RotTR. Apples-to-apples tests are nice, but it’s sometimes hard to gauge what might be the “best” configuration for a game from that. So, as we do on occasion, we’re providing some ‘Best Playable’ results, based on our findings from tweaking the games. The ultimate goal here is to hit at least 60 FPS on average, and not dip below 40 FPS on the minimum. Sometimes, this is easier said than done; other times, it’s a cinch. In this case, it sways towards the latter, as both of these cards are great at this ultrawide resolution. Let’s kick things off with a look at Battlefield 4. Battlefield 4 is an aging title, so it’s not often that graphics details have to be tweaked, and the RX 480 and GTX 1060 don’t change that. On the AMD card, I had to lob off ambient occlusion; on the NVIDIA card, it could retain HBAO. 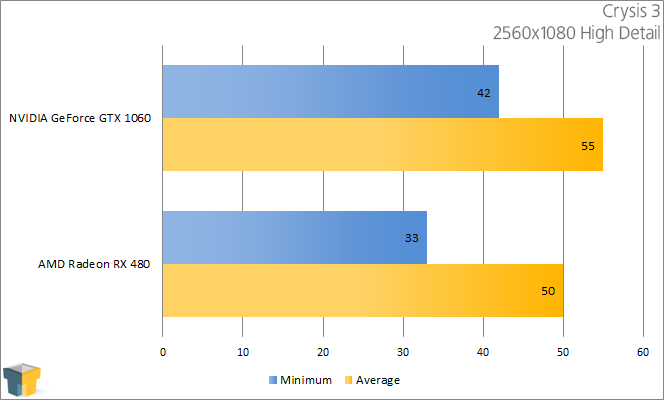 Both AMD’s and NVIDIA’s card manage to hit 60 FPS on average quite easily in Crysis 3, and at “Very High” detail, to boot. The exception is with the Shading value, which as it happens, is really intensive on a GPU. 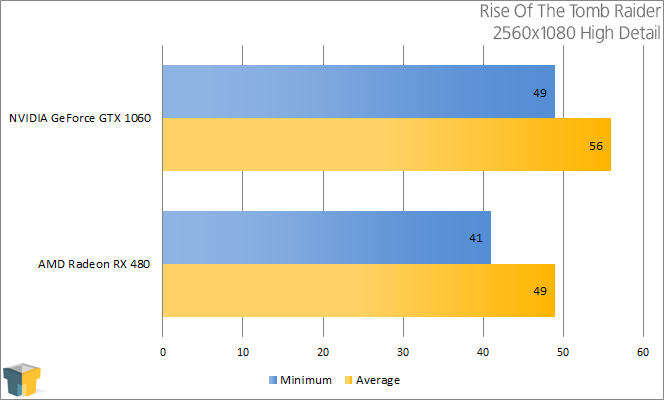 Reducing that from Very High to High made more than a 10 FPS difference in performance. Both of the cards are powerful enough to handle Grand Theft Auto V at the same graphical settings used in our regular GPU reviews (ie: almost maxed out). While I’d have to say that the next game, The Witcher 3, is the most beautiful game in this bunch, Rise of the Tomb Raider comes in a very close second. It also happens to be a lot more demanding, requiring more effort on my part to hit 60 FPS than I originally expected. Versus NVIDIA’s card, I had to disable tessellation, ambient occlusion, and reduce level of detail on AMD’s card to hit a safe 60 FPS. Even with the amount of tweaking done, both cards deliver a beautiful experience – and we’re talking 60 FPS at 2560×1080! As the test results at the top of this page showed us, both cards delivered close to 60 FPS to begin with, and in reality, eking more performance out of the game is almost pointless to me, as the minimum framerates were pegged at 50. However, to give this article a bit more substance, I decided to see what it’d take to hit 60 FPS anyway. 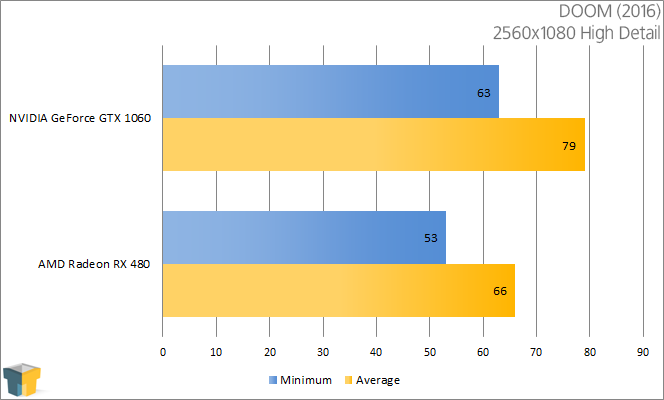 Interestingly, it took a bit more to hit 60 FPS on AMD’s card than NVIDIA’s, despite it being just 1 FPS behind in the main test. On AMD, Shadow, Terrain, Grass, and Water were reduced from Ultra to High, while NVIDIA’s card could retain the Ultra details of Terrain and Water. All told, though, both cards are amazing for this game at 2560×1080. Where you might run into an issue is if you want to use NVIDIA’s HairWorks; it’s up to you to decide which tradeoffs are worth it, ultimately. 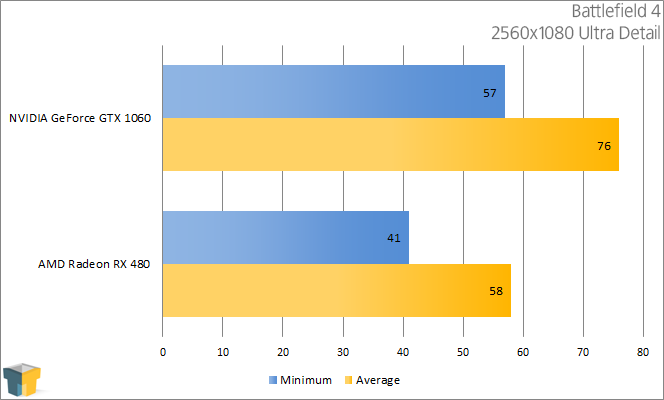 In our launch article for the GeForce GTX 1060, we established that it’s about 10% faster on average over the Radeon RX 480. There are some exceptions, though, such as with Hitman in DirectX 12, and while not covered here, AMD dominates thus far in Vulkan – at least where DOOM is concerned. If both the RX 480 and GTX 1060 were the exact same price, and you didn’t have more of a passion for one side over the other, then it’s obvious that NVIDIA’s card comes ahead overall. But of course, things are just not that simple right now, thanks to price gouging that’s still going on. Looking at Amazon, the $239 RX 480 is selling for between $320~$340 on average, and the $249 GTX 1060 hovers closer to $350. There are some exceptions, though, and most of them require you to be quick to take advantage. As of the time of writing, I see a $300 PowerColor reference RX 480, and on the NVIDIA side, two different ITX models are selling for $290~$310. Both are still ridiculous, obviously, as we’re talking a $40~$60 premium. Just know that if you are desperate for one of these cards, stalking various etailers is a good idea, but just be ready to act seriously fast if you want some semblance of a good deal. All we can do at this point is hope that the pricing situation stabilizes soon. In the meantime, if you’re looking at either one of these cards and want to go the ultrawide route, hopefully this quick article helped answer some questions. If you have a basic one unanswered, check here for an explanation of why ultrawide is amazing for gaming, and why I personally never want to go back to 16:9.